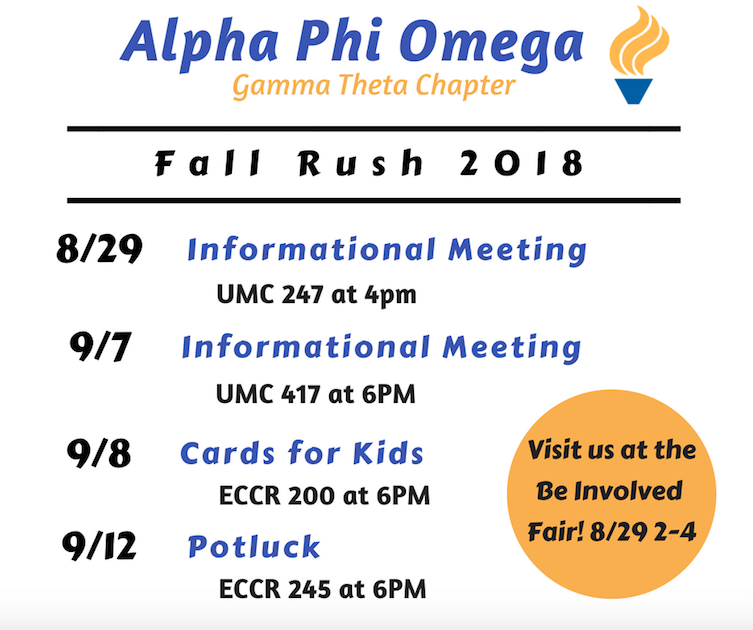 It’s that time again, rush, and we’re so excited for some new members! We have two informational meetings where anyone interested in joining APO can come and hear from brothers what APO is all about. Pick the date that works best for you and bring any questions you may have. On September 8th we will host a service event to assist the Cards for Hospitalized Kids Foundation by writing notes and letters to kids in the hospital, so stop by anytime between 6 and 8 to write a letter or draw and talk with brothers about the thing we do best: Service. Finally it’s a tradition for Gamma Theta to host a Potluck style dinner for rush each semester. Feel free to bring a dish, or just enjoy what we’ll have made for you! As always, if you’d like more info, don’t hesitate to reach out to us through our instagram, facebook, email, or in person through our office hours. We can’t wait to see you all next week!